Learning how to monster crop can be beneficial if you want continuous harvests without having to keep a mother plant. Clones from flowering plants produce branching monsters. If you grow cannabis, following situation might sound familiar: There is not a single cm² in your tent(s) that is not effectively used by your plants to collect all the light possible. Some plants are in vegetation state, a few plants are in flowering, and there might be one giant mother, taking up a lot of room, energy and air. There is a technique called “monster cropping” that can help you to grow more efficiently. When using this method, you don’t necessarily need to keep a motherplant to ensure continuous harvests. Combining this method with other forms of training, with a SCROG (Screen of Green) for example, can help to cut down on energy costs and increase yields. Monster cropping is a relatively new training technique and is also known as Flowering Clones. It works from the phenomenon that clones taken from a flowering plant grow extremely bushy when they are reverted into vegetation phase. Monster cropping can also be successful when growing outdoors, or in a greenhouse. One of the main advantages of Monster cropping is that growers don’t necessarily need a mother plant to ensure continuous harvests. By simply taking clones from your plants that are already been put into flowering, you can send all of your plants into flowering phase, and then take the next generation of clones from them. This method allows you to use the space, light and air, your mother plant normally needs, for the production of delicious buds. The second huge benefit of Monster cropping is that clones, taken from flowering plants, grow extremely bushy. They form tons of nodes and side branches. If you already made your first experiences with growing cannabis, you might noticed the substantial difference between a plant that has very small and weak side branches, to one that produces lots of heads and branches aggressively. Lots of side branches mean lots of buds exposed to direct light. High yields are the direct consequence of homogeneous light distribution to a high number of buds. 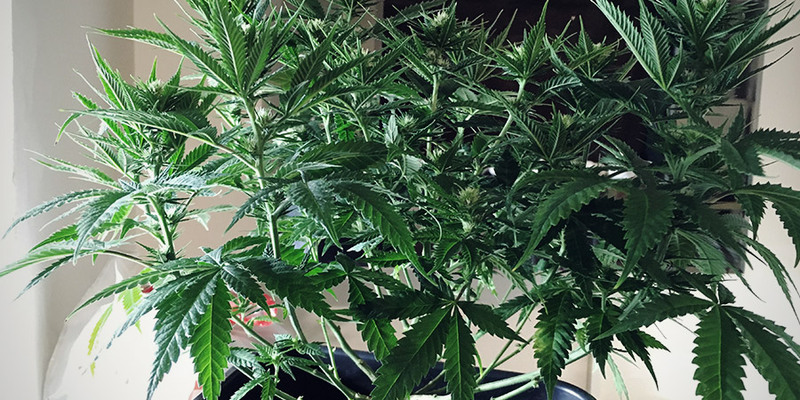 If you are not familiar with taking clones form cannabis plants, it’s better to do some reading about this topic before experimenting with Monster cropping. The main difference is that you take your cuttings while the plant is in flowering, and not in vegetation. When taking cuttings or clones, it can be a good strategy to do this according to the shotgun principle, taking more clones than you actually plan on cultivating. Not all of you cuttings will root and the reverting process can sometimes fail. It’s a balancing act, between taking as many clones as possible, and leaving enough growth on the donor plant to ensure high yields. The first new leaves produced by your clones can be deformed and weird looking. You don’t have to worry about this at all. If the clone survives and is healthy looking, it will produce normal looking leaves as soon as the reverting process is completed. The optimal timeframe to take your “Monster-Cuttings” is around 2-3 weeks after switching to 12/12. When you see the formation of the first buds, it’s time to take your cuttings. Place them into a glass of water for some time to ensure that no air to enters the vascular system. Now, you simply switch back to the light cycle you prefer for vegetating your clones, meaning 18/6, 20/4, or 24/0. You don’t need a lot of light intensity at this point. CFL’s with a daylight or “cool white” light spectrum get the job done. If you remove buds of your clones at this point, they will revert into the vegetation state. Monstercropping, and every other training method causes stress for the plant. This stress is on a hormonal level and can potentially be a good thing. It can induce the development of the desired growing characteristics. Most techniques are used to “train” the plant, to form a shape that uses the footprint of the individual growroom or tent most efficiently. Often it’s not just the space, effecting yields, but also the light intensity, and -distribution. It’s important to know that plants need some time to recover from stress. Stress can be caused by poor growing conditions but also by taking cuttings or removing parts of the plants like tops, lower branches and leaves. Beware that most of these methods, including Monster cropping, are primarily used when growing regular, photoperiod cannabis strains. If you grow autoflowering varieties, it’s best to keep the stress to the minimum. The life cycle is usually too short to give the plant enough time to recover and still finish with the desired quality and quantity. All kinds of Low Stress Training (LST), like leave tucking, Super Cropping (bending branches) or SCROG (Screen of Green) can be very beneficial when growing autoflowering strains. Everything which causes greater stress, for example pruning techniques like Topping, Fimming or Lollypopping, can potentially cause problems with autoflowering strains. Stunted growth can be the consequence, for example. This is a debatable topic though. You created a heavy-branching monster. The next logical step would be to think of ways to tame your beast. The SCROG-Method, or Screen of Green, is a simple but very effective method to do that. Combining Monster cropping with a SCROG makes perfect sense. By installing a SCROG-net at a certain distance over the canopy, one can increase horizontal growth and effectively use the heavy branching characteristics of the plants that have been Monster cropped before. The desired result is a grow space with an even canopy that makes best use out of the light provided. High yields and a superior quality product will be the consequence.